Corinne Frottier Sensei wurde 1953 in Brüssel geboren, wuchs in Österreich auf und kam 1975 nach Deutschland. Seit 1983 lebt sie in Hamburg, wo sie 1985 für den Rundfunk als Hörspielautorin und -regisseurin zu arbeiten begann. 1989 begegnete sie ihrer Meisterin Catherine Genno Pagès Roshi, von der sie im Juli 2009 die Übertragung (Shiho) erhielt. Sie ist Genno Roshis dritte Dharma-Nachfolgerin. 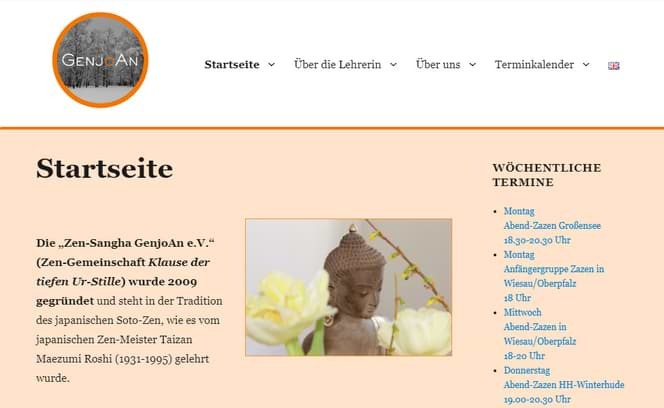 Im Mai 2009 gründeten acht Mitglieder unserer jungen Sangha den Verein „Zen-Sangha Genjo An e.V.“ Damit wurde eine Grundlage und Unterstützung für die Weitergabe des Dharma durch Corinne Frottier Sensei geschaffen. Seitdem wächst der Verein kontinuierlich. Mitglieder werden Menschen, die sich in unserer Sangha zu Hause fühlen und unter Corinne Senseis Anleitung Zen üben möchten. Der Verein organisiert Sesshins (mehrtätige intensive Meditationsveranstaltungen) in und außerhalb Hamburgs. SZ: So, my first question is how did you first come to Zen practice and what was going on in your life at the time? CF: I heard about Zen through my father who read a lot about Zen. I think he never practised a minute in his life, he died years ago, but he read an awful amount of Zen books and he was talking about it. Then he was very much also into Japanese arts, specifically painting and pottery. He loved Japanese pottery and he started doing pottery himself. So, through him, I got in contact with Japanese Zen and aesthetics. Then, actually in my 20s, I started with Tai Chi and I did Tai Chi for 10 years. In the meantime, I had moved to Hamburg and one day I saw advertising in a bookshop, that someone was offering Tai Chi courses and introduction into Zen meditation. I thought, this is really an interesting combination and I registered for that course. It was offered by someone you might know the name, Linda Lehrhaupt. You might have heard of her? CF: No? I thought so because she is American and she received transmission two weeks ago from Al Fusho Rapaport, I think. SZ: Oh, really! Oh, I should know then. SZ: Was that a Catholic nun’s school? Finally I told myself ‘Okay, I gave it a second try, and this is definitely it. I am finished’ with this. I started feeling a little relieved, you know, like giving me permission not to be there anymore, and at that moment, someone comes and whispers in my ear ‘Interview with Catherine’, who became later my teacher, Genno Roshi. At that time she didn’t even have transmission, so it was Catherine, interview with her. I thought ‘Why should I go there? I just decided to stop with this practice.’ But then I thought: ‘That will give me an opportunity to leave the zendo.’ So I left the zendo, I went to the room, and had a talk with her. I didn’t realize it at that time, but then and there I met my teacher. Even if hardship didn’t stop immediately after that, she had got me on the hook. So, that is how I stayed with Zen practice and she became my teacher and she is till today. SZ: What were some of the reasons, you mentioned them a bit, but what were some of the reasons that you found it so nightmarish? Was it the physical pain, or was it just having to sit there with yourself? CF: Yes. I think to sit with myself was worse than the physical pain. I mean, the physical pain, okay, that was not nice, but today I would say it was for me definitely a psychological dimension. It was staying with myself. I think many of us in our culture, we are not really used to staying silent with ourselves, because we don’t feel comfortable with ourselves. I think this is a very interesting and very important aspect and I definitely would say that I had no idea at that time how uncomfortable I feel with myself, in a way that I wouldn’t like to be in my presence. Which is an amazing thing to say, because we expect others to like being with us. CF: But if we don’t like it ourselves, why should others? CF: And I think this is a little bit the attitude. SZ: Like being a conjoined twin. CF: Yes. I had a few traumatizing experiences in my childhood and, of course, when you sit still for hours, you cannot, how do you say it in English, you cannot hinder, prohibit, that these things come up. CF: And then, of course, in the first moment, you feel totally at the mercy of those feelings and you don`t know how to handle it, it was really meeting myself in a way like I didn’t want to. SZ: Yes, you know, facing some unpleasant things. CF: Yes, facing some very unpleasant things; yes, definitely. SZ: I was just watching a movie that was made recently in Japan on the life of Dogen and, you know, there are some fictionalized aspects to it, but there was a point where Dogen was instructing I think it was a Shogun or something, a local Shogun, and basically the guy was asking him, “I see these demons every night. How do I get rid of them?” And Dogen said so you must befriend your demons, welcome them in. SZ: Or fighting back, right. CF: Yes. So she went to him and said, “Look, what are you doing, won’t you say something to that boy, I don’t know, maybe tell him to stop?” And he just looked up at her and he said, “No, no, mommy. You know, he wants to be friends with me, but he doesn’t know yet how to do it”. SZ: Pretty insightful for a 5-year-old. CF: It’s a lovely story. He was 5 years old that boy, and I think this is a little bit how we are told to invite and befriend our demons, but I think very often we don’t know how to do it, and that is the difficult part of it. SZ: Yes. I mean, it’s that whole, you know, your enemy is your greatest friend or ally, in Buddhist teachings at least. SZ: At what point did you find that changing for you, as it were, or at what point did you find that the practice was actually working in some way for you? Was it just something you kind of recognized after the fact at some point, or was there a moment that you remember? CF: Strangely enough, I would say even though I had those panics and those fears and, you know, this hard time with the emotional part of it all, I would say today looking back that I always had, deep down inside, I had a total trust. Somehow, I don’t think I had a moment where I thought: “Practice is working for me”. I think I never doubted practice, maybe sometimes I doubted if I wanted to go on with it, certainly I had this, but I had never thoughts about the working of practice. SZ: It might be like a gaining kind of idea as well. CF: I just talked to my students a few days ago about the fact that we always want to gain things and that in practice there is nothing to gain. In the beginning of ma practice I didn’t even think about gaining or not gaining anything. Maybe I was too busy with myself to think about it. That was not what was on my mind. I just had started walking on that path and I was doing one step after another, right foot, left foot, right foot, left foot, more like a little soldier, I think. SZ: And before you know it, you’re kind of somewhere else on the mountain. CF: Yes, it’s more like that. SZ: Well, I mean it sounds so cliché, but I was just talking to a Zen teacher named David Rynick, he is with James Ishmael Ford’s groups, and he was saying, you know, it’s really true, there is no destination at all, because once you get there, you need a new toy or you need to go on to the next thing; so you need to just immerse yourself in whatever it is you’re doing now, you know? CF: Yes. That’s very true. Of course much later I discovered that the gain I was aiming at was to get rid of my misery. SZ: Do you still practice Tai Chi? CF: No. I stopped. I would like to and I even think of maybe starting again because I have reached an age now where it would be good for my health and my body, so I am seriously thinking of starting it again. But I stopped after a while because Zen started needing more and more time and I wanted to invest more and more time in Zen. I couldn’t do both at the same time – I had to make a living, I heard to earn money also. SZ: Sure, yes, that little detail, you know. CF: That little detail, exactly. SZ: It gets in the way of practice. CF: Yes. At least in the way of formal practice, like going to sesshins or being able to spend more time with your teacher. SZ: Describe Catherine Genno Pages for us. Am I saying her name right? CF: You write it Pages, but the pronunciation in French is Pagès. SZ: Okay. So what was, I mean, you don’t have to divulge this, but what was that first encounter all about? And then, what made you decide that you wanted to practice with this person? CF: As I told you, I had been asked to come to interview with her. I came in and I had tears in my eyes and looked miserable. I had been crying in the zendo, so she asked me why I was crying, and it was very nice, because I spoke to her in French immediately. She is French and I am French, and as the sesshin was happening in Germany, she was totally astonished to have a French person suddenly in her interview room so, of course, it was this very human thing of, “Wow! Why do you speak French? Where do you come from?” Then she asked me what was the matter with me and I talked a little bit and we found out she too when she went to school she went to a Catholic nun’s school and so we found common things about our upbringing, but today, I would definitely say that was really only going on on the surface. From the first moment on, and I wasn’t even conscious of it, I met my teacher and it was a heart-to-heart meeting, which I only realized when I came back home. I mean, something happened it’s like falling in love, you cannot explain it. You meet someone, you look into each other’s eyes and something happens and you don’t know really what it is. CF: That is how it happened for me. I didn’t understand it immediately. I remember that shortly after that, Genno Roshi would offer a weekend sesshin in Amsterdam, also in a place that doesn’t exist anymore, and I went there and when I came back from that sesshin, I met friends and I started telling them about how the weekend had been, and a friend looked at me and said “Corinne, you are completely in love with that woman!” I looked at her and I said, “What? What are you saying? Are you crazy? !” I really felt embarrassed. But then I went home and I thought, “She’s right”. SZ: Sure and now, you know, this is a related question. It’s a gender-related question. Do you think that you found her more accessible, this is of course in retrospect, due to the fact that you shared the same gender? Was it easier for you to find intimacy that way with another woman? CF: Well, I would say certainly it was because of my biography and how I am. I mean, I have relationships with women. I found it probably more easy to feel intimate with her, but at the same time, after all my practice, I would say today that though it is clear that there are differences between men and women on the relative level at least, I am persuaded that in a certain way the gender of your teacher plays no role. Your teacher will appear to you in the form, in the gender form, that you need. You see? Gender plays no role, but if you need for the meeting a certain gender, that will be the gender. I don’t think that really one could say, “I feel more intimate with a woman or more intimate with a man”. It depends on the person. You know, if you would feel more intimate with a man, your teacher will appear as a man. SZ: Sure. That was a weird question, I know. CF: Not at all. I understand that question, because there is a lot of talking about this, and there is a relative and an absolute side to look at it. For me, the woman was the right form. But maybe if I had been someone else, and by that I absolutely do not mean any sexual orientation, I would have felt more intimate with a man. It’s very individual, I think. SZ: Now, what advice would you give to people who are starting out in a meditation practice? What is one supposed to be doing when they are practicing zazen, for instance? CF: When they are practicing zazen? CF: Well, Genno Roshi does not put a lot of emphasis on the posture. I mean, it is clear, we are taught the posture at the beginning because the right posture supports you. But if it starts to be torture, then it is not a support anymore. So, on one hand, there are a few things about the posture I think that are important: your spine should be straight so that breathing can flow freely, but there are many different ways of having the spine straight. You can sit on a chair; you can sit on the floor. It depends also on your physical condition. CF: Yes, compulsion, but something like if I have a list of things I have to do today, I have to do this and this and this, so each thing is, is there a name for it? SZ: A checkmark? Like a checklist that you have to go through? CF: Yes. Yes, something that I have to do. The word isn’t coming to mind for the moment. But that it is something that I am obliged to do, an obligation. That’s the word. I keep saying to people who want to train with me, you know, no one is forcing you to do Zen. You don’t have to do Zen. You can be very happy in your life without Zen. So, if you do Zen, if you want to follow that path, it is because you want to do it and because there is some part of you that feels well there. If it is only misery, then why do it? You are not going to be a better human being or have a better status in society because you are a Zen student. Of course it can be helpful to have an introduction into posture, but it is much more important how you are spending your time during meditation. What are you doing there? CF: Are you just dreaming? Are you preparing your plans for the next day? That’s what the important thing is. SZ: A lot of times, the early instruction will be to follow your breath or count your breaths; there are many different ways of putting it. What is the emphasis there in that? CF: To say follow your breath? CF: I really do this only in the beginning and only if I have the feeling someone has an aspiration for that because, for me, but let’s be clear, Adam, I am only telling you my own view, I am always open to hear others, other views. CF: Okay. So, my experience and how I see it is that counting the breaths or following the breath is really to help calm down a little bit the mental activity, because we have so many inputs that come the whole day and it is even becoming more and more, information and the internet and surfing around, and zapping on the TV, and wherever you go there is music, and you have your mobile phone, so constantly someone or something is asking for your attention. Your mind never gets a rest. So, when you sit down, I think it is incredibly difficult to just be, to stay, in your own presence. You will not stay with yourself. You will constantly go away from yourself. You will go to this and this and this thought. You don’t stay with you. I think being aware of your breathing is just helping you to stay with yourself because your breathing is always staying with yourself. It’s there where your body is, and so counting your breaths or breathing is helping you to be where your body is, and that is the beginning. SZ: Instead of like a monkey just hopping from vine to vine; you know, monkey mind. CF: Yes, yes, and not being here. That’s the thing. So, it is a tool in the beginning to help you be here, but I don’t let people be too long on it because then there is a tendency to make it the content of meditation and it is not at all. Counting your breath has nothing to do with meditation. It is just helping you to sit down in the beginning and stay calm. That is how I see it. SZ: Sure, because if one maybe goes further into the practice, would you say that concentration sort of opens up towards everything, the environment and everything else? CF: I would say, concentration drops away. There is a point when even concentration is not needed anymore. Vast emptiness manifests beyond concentration. SZ: Could you describe Genno Roshi? You talked about her earlier on, but (if possible!) just describe her as a teacher for you over the years? That would be great. CF: Describe her as how I perceived her as a teacher? SZ: Actually in whatever terms you want to describe her in. CF: Okay. Wow. You are asking me difficult questions! (Laughter). SZ: I know. It’s one of those…. CF: Yes! But it’s okay. I will try to answer that. Well, first of all, of course, I will tell you that she is a wonderful teacher. (Laughter). She is a wonderful teacher for me. What was very important for me in the beginning is that I had the feeling she was an extremely patient teacher with me, which is a funny thing to say because, on a human level, just as an everyday human being, I would say Genno Roshi is an incredibly impatient person. But, as a teacher, from the Dharmic point of view, she is very patient, and she gives an immense lot of space, which, for me, was just what I needed. I guess most of the students she has need that, otherwise they wouldn’t be with her. So, she gives a lot of space and is very patient. The other thing that I really appreciate enormously with her is she has absolute integrity. That is also something. She is a very, very, integer person. Do you say that in English? CF: Yes, but not only ethical. She has a lot of integrity but I don’t mean it only in an ethical way. Just as a whole person, she is very honest and very straightforward. Very honest. I would say even it is an important part of her Dharma. She always says it is all about having faith and being honest, and being honest to oneself. That is really what I have learned, constantly, being honest to oneself. That is very important. She puts a lot of emphasis on that. In the meantime, I am teaching myself and so the more I am in this new phase of my own practice, I appreciate and I learn from and I absorb this thing of being honest to yourself. This is really what practice is about, an important part of it I would say. Something else is that she will not make compromise where she thinks compromise is not the right thing in that moment. I don’t want to say she is someone who never compromises because in an everyday life situations, of course she is capable of compromising, but in the Dharma, she would never compromise even if it becomes very uncomfortable for herself. That is also a crucial teaching for me. CF: To be uncompromising in the Dharma. I must really say in the Dharma, because of course in everyday life she would not be this kind of righteous person who would not compromise, but in the Dharma she follows really her intuition. In German, it is “to be one with the heart”. Okay, in English it sounds a little bit kitschy, but maybe you understand what I mean. SZ: No, it was perfect. Earlier on in the interview, you kept on mentioning a bunch of these places that you had early on gone to that just sort of disappeared, and I was just curious to know, is that kind of common in Europe, or maybe it is just specific to the Netherlands, I don’t know? CF: No, I don’t think it is specific to the Netherlands. I think certain places had to close down for economical reasons, or the group that was taking charge of a certain place dissolves or has no more members. I wouldn’t say it is specific to any geographical part, that it happens more in the Netherlands than somewhere else. CF: No, no. I understood. It could have been, but no. I don’t think it is specific to the Netherlands. It’s just some places disappear and some others are created new. Of course, I think we all have to fight with economic problems, which I think is a very important part of Zen practice in the west now. We don’t have the resources that Zen has in Japan. SZ: Yes, that is very true. CF: So, that is an important thing. SZ: Yes, it is pretty much left up to individual organizations (unless they have the backing of a larger one). CF: Yes. We create associations and the members pay and so it’s not like the Catholic church with the Vatican where there is an enormous fortune. We don’t have that in the western Zen community. SZ: You mean you don’t have basements filled with golden statues of the Buddha and endless relics?! CF: Well, Adam, I will tell you. We have, but it is secret. SZ: Aha! I knew it. I will have to nudge you for the location! CF: (Laughter). No, I wish we had. We would be in a different situation. SZ: True. Although, large institutions can become a bit too polished for some people. CF: Yes. It could become then an institution with a lot of power play around it. Money, unfortunately, does that. Absolutely, I agree with you. SZ: Yes. It is always a challenge. CF: There are pros and cons for these things. SZ: Yes. I mean, it makes the everyday running of it easier, much easier. I am sure there are months where you worry about whether the place is going to stay open or not. CF: Yes, absolutely. It’s part of the game. SZ: So what have been some of the challenges? You run a place called Zen Sangha Genjo An, is that right. SZ: So, what have been some of the challenges of actually starting up one’s own group and keeping it going, you know, keeping it open, the doors open? CF: When I started the association in 2009, which was also the year when I received transmission, I was able with the donation of three people, two very good friends of mine and a student, to buy a little flat here in the house where you see me interviewing; it is under the flat where I live. It is small, very small, I mean, the whole flat is 40 square meters, but still we manage very well. We have a kitchen and a little zendo and for the weekly zazen it is perfect. I guess many of us are in that situation in the West, that because you want to finance a practice place, you start a lot of mental activity around how to get money in. I found myself suddenly meeting advertizing professionals, discussing the layout of a website, what it should look like to attract people, designing flyers and posters and so on. And then one day I realized, “Oh my god. It looks like I am starting a business.” It had developed unconsciously, for a while all those steps seemed so natural. I remember one of my students was there and we were starting to install the website and suddenly I told him, “Wait a minute. I am not selling something. I have nothing to sell. I have no product to sell. We should not lose that out of sight.” I often think of Zen masters in former times, you know, they would go and live somewhere on the peak of a mountain or in a cave, I don’t know, and people would find them, yes? Today is another situation. SZ: (Laughter). There was no landlord waiting for them in the mountain cave to get their rent. CF: (Laughter). Absolutely. So, what I think is it should be a little bit of something of both. On the one hand, I do what is necessary and that is enough. There should be also a part of trusting that it is going to go its own course. I mean, people who need to find me will find me. Of course, it is nice to have a certain amount of members so that we can economically afford things, but I try to be very attentive to not suddenly fall into an attitude of running a business. That I would not like personally. Maybe others have different ideas about this, but that is how I feel. CF: Absolutely. The internet is very important. We used to have fliers we would distribute in specific places, but when I ask people who are newcomers, how did you find us, 100%, not 99%, 100% will say we found you through the internet. The other thing that I also discovered that in my eyes is very common nowadays, which was also different in former times, is that the way people find you is that they move to a certain neighbourhood, then they go on the internet and they look at what is in my neighbourhood? Where is the next bakery, the next hairdresser and the next Zen group? You know, this is a little bit like that. I mean, it happened to me that people would call me and say, “Oh, I would like to come and do zazen with you” and I said “Yes. You are welcome. We sit on these days and at these times.” Then they will call me half an hour later and say, “Oh, I looked on the map but you are half an hour away from where I live” and I said “Yes…” and the person would say “No, that’s too far for me. That’s too far away.” So, you see, I don’t mean to say by that that everybody has that attitude, but it is not uncommon. You go on the internet and you see what is around the area where I live. SZ: How many groups are we talking about in your area, in Hamburg, or just Germany in general, for Zen? CF: Oh, many. There are many, many Zen groups in Germany, and there are quite a bunch of Zen teachers. In Hamburg, Hamburg is the second-largest city in Germany, there are quite a few Zen groups but we don’t have many Zen teachers here. On the other hand, I must say, I am a young teacher, not young in age, but I haven’t been a teacher for very long, so I am not so known here yet. It will need time. I trust that it will develop. SZ: You kind of figure out what you are doing later on. You just kind of do it and then later on you kind of figure out, oh, that’s what I was doing. CF: Yes. Exactly. The Sangha is growing, slowly, slowly, and I am very happy about how things are going. SZ: Very good. I was curious, in your lineage, in the Maezumi lineage there is that Harada-Yasutani component and, I was curious to know if you personally work on koans, as well? CF: Yes, we do. Maezumi Roshi’s lineage belongs to the Soto school, but we do also work with koans. In my training I worked on koans with my teacher. SZ: How would you describe the Maezumi lineage’s approach toward koan practice or introspection? I don’t know if you make a distinction there. CF: Well, this is very difficult to answer, Adam, because first of all, I have no comparison. I don’t know how others, in fact I can say I have no idea how other traditions work on koans. Or maybe I have one example because one of Genno Roshi’s students, a young Dharma brother of mine who is living at the Center right now in Paris with her and with some other students, went to Japan for 2 years and lived there in a Rinzai monastery and then he came back. He told us a little bit of how they worked with koans there and it is completely different than we do. You go in, you present your koan and even the way you present it, it is much more on an energetic level, you know, like shouting or hitting the floor with your hand, you know, very physical things. Then sometimes you would go out and ask yourself, “Did I pass my koan or not?” You didn’t know. Then when you came into Daisan next time you would get the next koan, which meant you had passed the previous one, but you didn’t know why, and you didn’t know why you hadn’t passed it the time before. So, it was a little bit confusing. That is the only comparison I have. I can definitely say that is not the way we do it. SZ: Okay. How do you do it? CF: It really depends, on the teacher. So, I would say that the specific way of how my teacher works with koans is that in the first part, she says very little. She really lets you, how do you say, gnaw on it, you know, like a dog on a bone. CF: Chew, that’s right. She lets you chew on it, really, and she would not say a lot. You would go into Daisan and you would present, or you would say something about it, and maybe she would answer, sometimes she would not. So you were really into the process of it physically as well as mentally. Then, when you presented the koan eventually, not immediately, she would say, “Okay. That’s the presentation.” And then she would ask you, “What is the point of the koan?” to check if there was really an insight on the subject. She wanted to make sure that you really saw something and that it was not just a coincidental shot. SZ: And then you’re through, right. CF: Yes, and I must say I appreciate this combination, and maybe it is a little bit the Western style, because I think in Japan and from what I read and heard, it would not be seen in a positive way that you talk about it also. CF: So, I think it’s this combination that works best for us: first, of course, not saying anything and the student really has to go into the process of it. But then when he or she presents it, to check then, not every koan, for some koans it is maybe not necessary, if the point of the koan really has been seen. That is how I learned to work with it. SZ: That was insightful for me, because I am always curious about these different approaches to it all. You are totally right, too, it differs from teacher to teacher, really, but it is still interesting. CF: Yes, I am sure. It is. SZ: Right. No you can’t go. Somebody bolt her to the chair and we’re not leaving until she answers this. I was curious if there are any books that you found helpful to you over the years that you would recommend to people who are interested, related to Zen practice. CF: Well, you know how it is in Zen, when you start Zen. Actually, a friend of mine said “It is very interesting, Zen speaks a lot about how books in fact should be near the toilet” (laughter). CF: You know what I mean, yes? That reading books is of no value at all. But still, as this friend who studied Japanese literature and of course there is Zen literature in it too, he pointed out that Chinese and Japanese Zen literature is amongst the vastest and most varied in the world. So, that is the contradiction which Zen likes very much. It is true that in the beginning I actually don’t recommend to read too much, because really, my experience is that people put so much stuff in their heads and then they lose contact to a simplicity of themselves. You know, many people then have the feeling “I am too calm, I am too ordinary, I am too boring, I am too this and that, and I have to put in some nice beautiful Zen sentences.” So, I think I will tell you nothing very interesting, Adam, because what I recommend is what I think many recommend. I think Suzuki Roshi’s Zen Mind, Beginner’s Mind is a wonderful book for beginners. CF: The other one that I like very much that I recommend also is Chögyam Trungpa’s Cutting Through Spiritual Materialism, which I think is also a basic book to read. SZ: Sure. That book cuts across all kinds of different traditions. CF: Yes. So I would say for a beginner those are the two books that I would recommend. For the rest, I would say don’t read too much. (Laughter). CF: Yes. Absolutely. I mean, for light reading and because it is amusing also, in Europe, I don’t know if in America he is known at all, there is a very famous writer of, how do you call this in English…I will tell you the author, maybe you know him: Janwillem van de Wetering. SZ: Yes. He wrote a few books on Zen and detective novels. CF: You know his name. Detective novels, that is the word I was looking for, detective novels. He wrote two very beautiful books about his own experience of Zen. So, that might be also nice for a beginner to read because it is amusing and it is not putting too much ideas in your head. SZ: They are really good books. I read A Glimpse of Nothingness: Experiences in an American Zen Community and I have Afterzen: Experiences of a Zen Student Out on His Earhere, which I want to read. If you are coming to practice like, “Oh I am going to put everybody on a pedestal and my practice is special,” he is going to bring you down quite a few notches pretty quick. Good book. CF: Yes. I enjoyed reading them very much. SZ: My final question is very open-ended. Do you have any, it sounds funny, parting words or final thoughts (laughter). It’s like you are going to die or something. What are your last and final words to our audience? SZ: Well, thank you. That is mutual. I always like it when people say that! SZ: There is a joke around that. You might know him, he is in your lineage – Engu Dobbs. He is one of Peter Matthiessen’s students. CF: (Laughter). It reminds me that a few years ago, I was in a little group with Genpo Roshi. At that time he was already in his Big Mind business, but still we were a little group and my teacher was there too, it was very nice. We were sitting together and somebody started to speak of death and dying and testaments and so at a certain moment, I looked at him and I said “Well, Genpo Roshi, speaking of testament…” Do you say testament in English, you know, Last Will and Testament? CF: “What would you leave us behind? What is your last word of Zen? You know the koan, “What is your last word of Zen?” What would you like to leave us as a legacy?” And he looked at me and he said “Well, Corinne, you might be very disappointed, but now I have to go and pee.” And I immediately understood. Sometimes the last word can be very poetic and sometimes….. 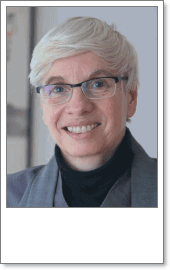 This interview was transcribed by [Sweeping Zen] volunteer editor, Janet Pal. Thanks Janet!